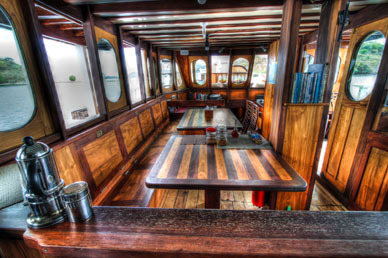 The 27m Duyung Baru is a traditional Indonesian Phinisi liveaboard offering an affordable luxury liveaboard experience. 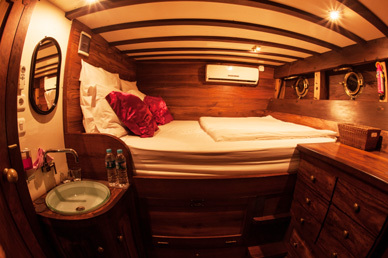 With 3 cabins on board to cater to a maximum of 6 guests, the Duyung Baru Liveaboard offers personalized and intimate trips ideal for small groups or families and private charters. The owner/operators of the Duyung Baru are Volker Korth, a German national and his Indonesian wife Yani Korth. 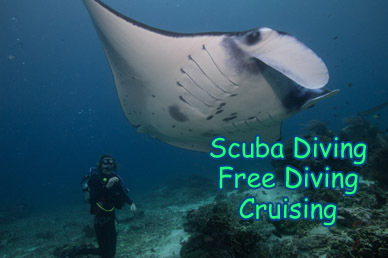 We cruise between the iconic dive areas of the Komodo National Park, South Sulawesi and Selayar's virgin coral gardens. 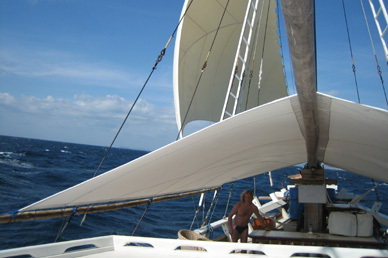 Together they have been running private tours throughout the waters of Indonesia since 1998 and in particular the Komodo National Park making them two of the most experienced tour operators in the region. So! What makes us so unique? 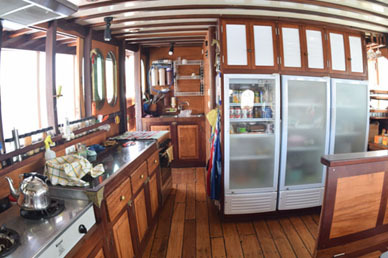 Here at the Duyung Baru, we have constructed an extremely practical, clean and efficient diving vessel, while also being fitted with all the modern conveniences of a luxury hotel. 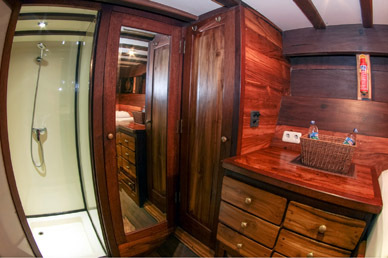 We personally designed spacious luxury cabins complete with air conditioning and hot showers so that you can live in complete comfort during you time on board with us. We have a beautiful kitchen serving international and local cuisine and have added a comfortable wooden saloon perfect to sit around and enjoy your meals and to socialise with your fellow divers. 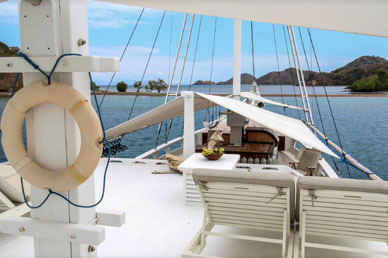 ​​A top deck sun-lounge area ideal for sunbathing, relaxing and enjoying the impressive island vistas. We have trained up our five enthusiastic and loyal local crew who have been with us since 2002! These 5 experienced crew members of the Duyung Baru team allow us to provide a truly personalized service for our 6 guests. 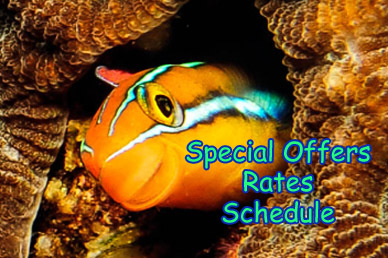 ​We chose to focus our diving trips in the stunning Indonesian archipelago, a true remote paradise packed with 5-star dive sites to match our 5-star liveaboard and crew. Indonesia offers everything from healthy coral reefs to giant matas and sandy critter hide-outs, with so much to see that one trip is never enough. 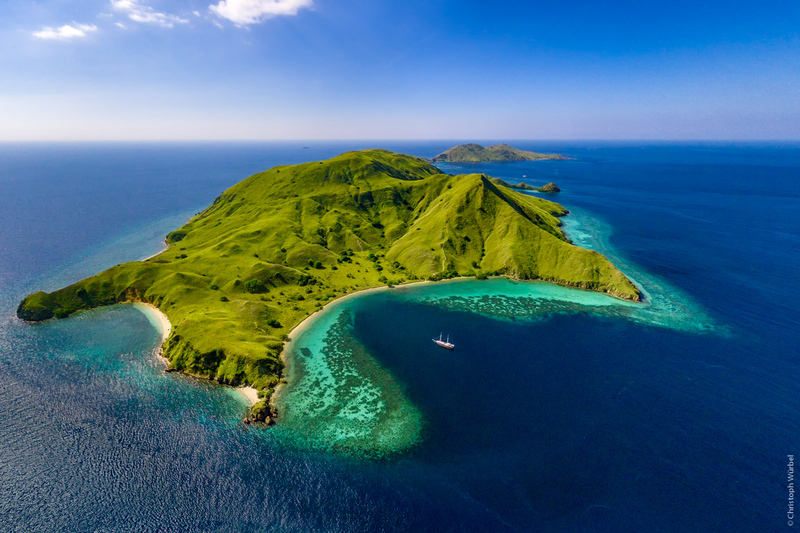 Since Vovo has been operating in the Komodo park for 20 years he draws upon a wealth of knowledge to always try and ensure that his divers go to uncrowded dive sites as well as relatively unknown secret locations around the park. Thanks to our small groups we are able to run custom itineraries often deciding on where we want to dive the night before depending on what the weather conditions and also taking into account what our divers are excited to see. We are also fortunate enough to be able to offer you Nitrox on board as we have a Nitrox blending system on deck. We understand that peace and quiet is important to you on your vacation so we have also installed a silent compressor to ensure that you are able to adequately rest during your surface intervals on board.